Application: Two X-Y robot stations that simultaneously assemble multiple parts with automatic eject of completed assemblies. Visumatic develops complete, “plug -n-work” X-Y robot assembly machines. In this dual action system, each robot is fitted with a Visumatic VPM-X.2 Power Module screw driving spindle designed to automate your assembly line. Your part is simply presented to the nosepieces and screws are stroked into the part. The system shown, designed and built by Visumatic, uses two 2,000mm x 1,800mm XY robots that work in concert with each other to install 36 screws into a plastic cabinet with extremely tight clearances. The system, once initially loaded, works non-stop. 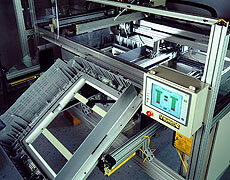 Once cassettes are loaded; both robots begin assembling one part, then the other while ejecting the completed part. The operator unloads the completed part and reloads. By the time the reloaded part is in place, the XY robot completes the second part, moves back over and the process is repeated. Each XY robot is capable of assembling either side independently. - Extruded aluminum or powder-coated steel painted to spec. Screw driving assembly station with pallet lift & locate. 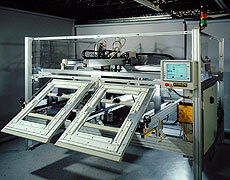 XY robot installs multiple fasteners and drive locations into conveyor fed parts.